“They’re like the coral reefs of the forest.” So says PhD student Troy McMullin of an often-overlooked but complex mini-ecosystem that serves as an early warning system for mounting pollution and habitat destruction threatening the Earth’s biodiversity. To visit these “reefs,” you don’t need flippers or a snorkel. Maybe rubber boots ─ like the pair McMullin pulled on each morning two springs ago for a week-long collection blitz among the royal palms, giant ferns and lurking alligators of the Florida Everglades. 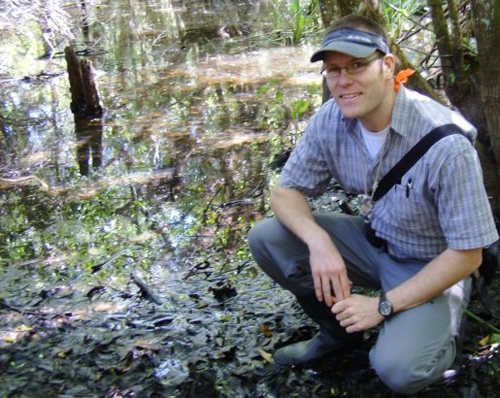 Two years later, he’s the sole Canadian co-author of a new international paper describing hundreds of lichen species from that corner of Florida, including 18 kinds new to science and 89 notched in North America for the first time. Lichens? Those mossy or scaly growths that can make rocks and tree branches look like they’ve contracted some weird skin disease? Look closer, says McMullin. Lichens marry fungi and algae in a partnership benefiting both sides. Fungi provide water and minerals, while algae use photosynthesis to make food. About 17,500 species are found all over the world, including about 1,000 species in Ontario. Highly sensitive to habitat disturbance and air pollution, especially sulphur dioxide and metals, lichens serve as a barometer of air quality and ecological change. They’re an important food source for numerous animals, insects and birds, particularly in the boreal forest and the tundra where they sustain such iconic creatures as caribou through winter. Certain kinds of blue-green algae in lichens grab nitrogen and improve soil fertility. Some lichens may contain rare chemicals useful for medicines. In 2009 an international team of lichenologists was all eyes while collecting more than 400 species in Fakahatchee Strand Preserve State Park in southwest Florida. Headed by Robert Lücking from the Field Museum in Chicago, they published their paper this month in the Bulletin of the Florida Museum of Natural History. Not the richest location on the continent. That’s the Klondike Gold Rush National Historical Park in Alaska, home to more than 700 species. One of Ontario’s hot spots is Bruce Peninsula National Park, with about 330 species. That number was rung up during another week-long collection blitz by many of the same lichenologists on the Florida trip. McMullin was also part of that Bruce team; later this spring, he’ll join the group again on a trip to New Brunswick’s Bay of Fundy. Lichen biomass is greater in temperate and cooler regions such as northern Canada, where some can spread in vast ankle-deep mats. There they face less competition from fast-growing vascular plants with their light-hogging leaves and large root systems. That might suggest that lichens would lose out to palms, cypress and giant ferns in a subtropical place like Florida. Not so, says McMullin. The tropics’ signature plant diversity extends to lichens, although they’re generally smaller there than their temperate cousins further north. 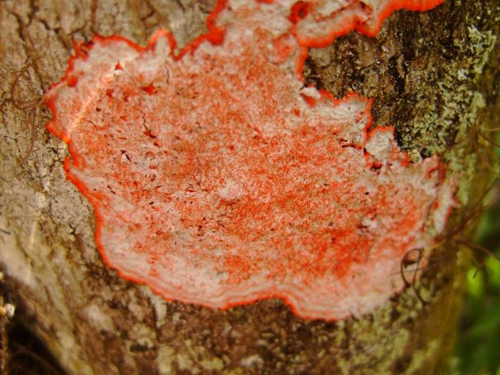 In their paper, the research team suggests that tropical lichens use a number of tricks to avoid competition and to disperse themselves, such as growing on plant leaves ─ uncommon in Canada. Or at least you find fewer of them, as in Guelph. 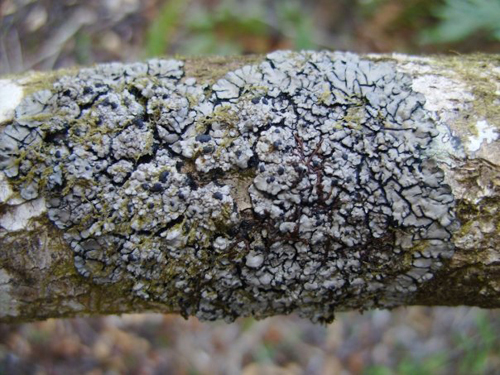 McMullin’s survey of the U of G Arboretum has turned up only about 40 lichen species, compared to the hundreds carpeting the Bruce Peninsula. All of Guelph’s varieties are included in a chapter co-written by the student in Woodlot Biodiversity, a book published last year by his supervisor, Prof. Steve Newmaster, Integrative Biology. Of those 40, about six species dominate in Guelph, including three kinds mottling a stand of oaks visible through the west-facing windows of the science complex near McMullin’s lab. Can you spot three species of lichen growing on this U of G tree? Look closely at those “mossy” trunks and you can pick out all three species. The smeary yellow-green is candle-flame lichen. Dotted throughout are orange flecks of hooded sunburst lichen and silver-coloured encrustations of star rosette lichen. Those species pale against the form and colour of more striking specimens that McMullin has collected during his travels. A branch from a Douglas fir is adorned with tangled wolf lichen whose brilliant yellow pigment comes from an acid used historically as a poison for foxes and wolves. A spruce limb dripping with brown strands of horse hair lichen came from field work in Northern Ontario for McMullin’s doctorate. This lichen is a primary food for woodland caribou, particularly during winter. McMullin has compared lichen diversity in natural and disturbed locations, helping to determine which species are available for the animals around Iroquois Falls and English River and how to manage for them. After graduating this spring, he plans to spend a year as a post-doc at Guelph turning part of his thesis into another Ontario lichen guidebook. Many of his samples end up in the U of G Herbarium under the direction of Newmaster, who belongs to the Biodiversity Institute of Ontario on campus. From Florida, McMullin brought back about 70 species for the herbarium collection. With so few lichenologists in Canada, McMullin is often called upon to help conduct surveys and status assessments for ecologists and governments. He has surveyed a national park in Nova Scotia and developed a list of all lichens growing in Prince Edward Island. He’s co-authoring a field guide to lichens of the Maritimes. A former canoeing and hiking guide, he grew up in Oakville and studied biology at Trent University. 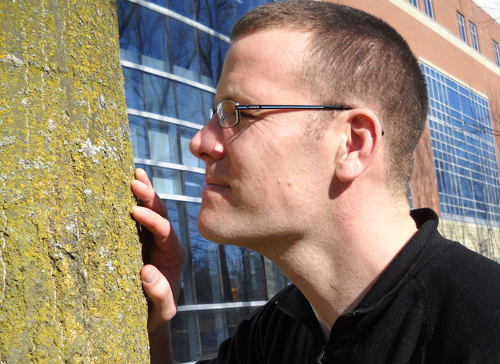 It was during his master’s degree on old-growth forests completed at Dalhousie University that he was attracted to lichens.